Rich's Mum and Step Dad came up to visit us a couple of weeks ago, so we headed into York for the day to do some sightseeing and shopping. 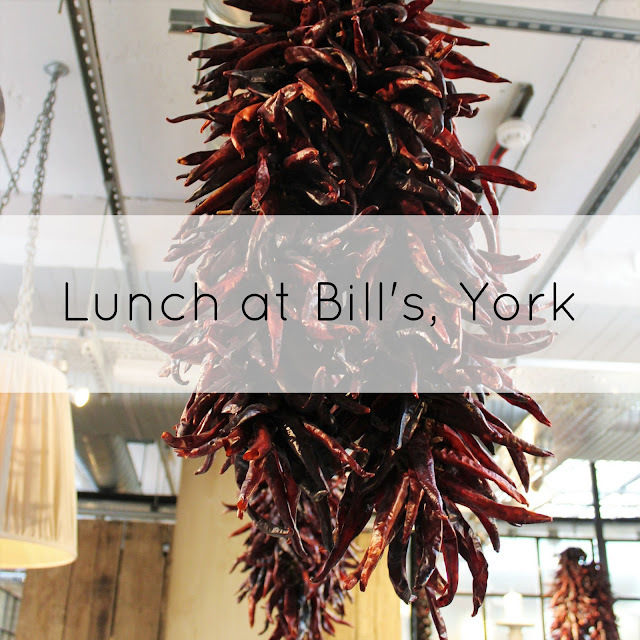 When trying to come up with somewhere to eat for lunch, I suggested Bill's as when I went for breakfast last year it was amazing. The interior of the York branch is just as cool as the one we went to in London, with the quirky decor and the produce available to buy lining the walls. It was pleasantly busy, providing a nice hubub of background noise and a good atmosphere. The thing I enjoy the most about Bill's is the variety of people you get in there. You can turn up in your jeans and rucksack from a day out sightseeing, or get dressed up in heels and a dress and you'll always fit in and look right. We all pondered over the menu trying to decide what to order. I was being torn in so many directions. I'd heard great things about the Bill's burgers, the veggie options sounded amazing, as did the lamb koftas. You always think it's a good thing to have so many great options on a menu, but then you realise it just means you take far longer than necessary to order. Rich went for the Bill's burger. He said it was a good burger, and the addition of guacamole was welcomed, even if it was a bit odd that it was served on the side rather than in the burger itself. I didn't get to try any, which definitely means he enjoyed it. In the end I decided on the lamb koftas and they were amazing. The combination of the koftas, flatbread, hummus and tzatziki was spot on, being flavoursome and perfectly filling. I've already began to look online for recipes to recreate this at home I loved it that much. Rich and I shared the spiced tortilla chips as a side dish. These were okay. It was nice that the tortillas were homemade but they were quite greasy, so they overpowered the dips with their flavour. I definitely couldn't manage more than a few of these and probably wouldn't order them again. Rich's Step-Dad ordered a burger, which he thoroughly enjoyed, and Rich's Mum ordered the fish pie. It wasn't very photogenic, being a little bit burnt on top, but she still enjoyed it nonetheless. We were going to York Chocolate Story straight from there so I didn't get to try one of their amazing sounding desserts (the treacle tart is calling my name) which means I'll definitely have to go back another time to satisfy my cravings. York is definitely a city of desserts, as there are always far too many options of where to go to get something decadent and sweet. It really is the Chocolate city.